Another guest post from Robyn’s Online World Thank you Robyn! This past Sunday we went to my parent’s house again, this time for my nephew’s birthday party and our monthly game night. My nephew asked to have kabobs again for the meal (the birthday person picks the food). Last year they pre-made the kabobs, this year my mom decided to do a make-your-own-kabob party which I thought was great! I have done this at my house with things like pizza, tacos, etc., but had never thought of doing kabobs. Before everyone arrived Mom did the prep work. She cut up the meats and marinated them; she did beef and chicken. 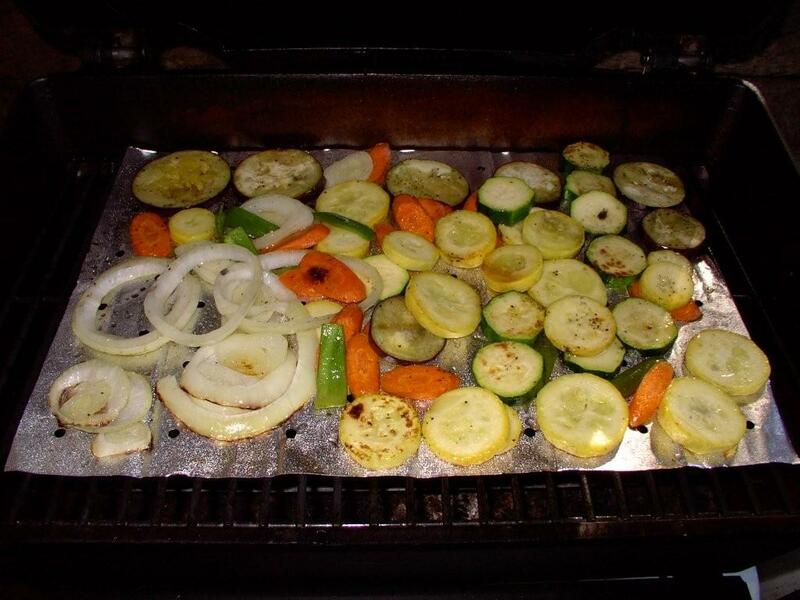 Then we had all types of veggies like cherry tomatoes, onions, mushrooms, squash, red peppers, green peppers, orange peppers and even pineapple which is fabulous grilled. She had some metal skewers but also soaked wooden skewers ahead of time since there were so many people. My suggestion would be to have everyone pick the items they want and put them on their plate and then make their kabobs. This way you don’t have to worry about cross contamination with the meats and the other items. If you have guests who are squeamish about raw meats offer to make theirs for them. As the guests complete their kabobs they go out to the grill. My dad was the chef at our party. He grilled the kabobs as they came out. In addition he made some hamburgers and hotdogs for those who didn’t want kabobs. Make sure that you place the cooked kabobs on a clean plate for your guests, not on the same one they brought the raw kabob out on – again to avoid contimination from the raw meats. The marinades can be anything you want. I personally prefer beef kabobs and have found a ton of great recipes for them on Beef It’s What’s For Dinner. We are, sadly, without a grill right now. Hubby’s nice gas grill has died so we are saving up for a new one. This means all BBQ invites are accepted right now LOL! So are you a kabob fan? What is your favorite marinade or combo for kabobs? It wouldn’t be right for me not to include grilled lobsters in my grilling 101. Grilled lobster is not as hard to prepare as one might think. Follow these steps and you will be eating like a king in no time. Step 1 Picking out your lobster: You want to make sure the lobster you choose is lively. The more they are snapping their tail and flailing their claws the better. 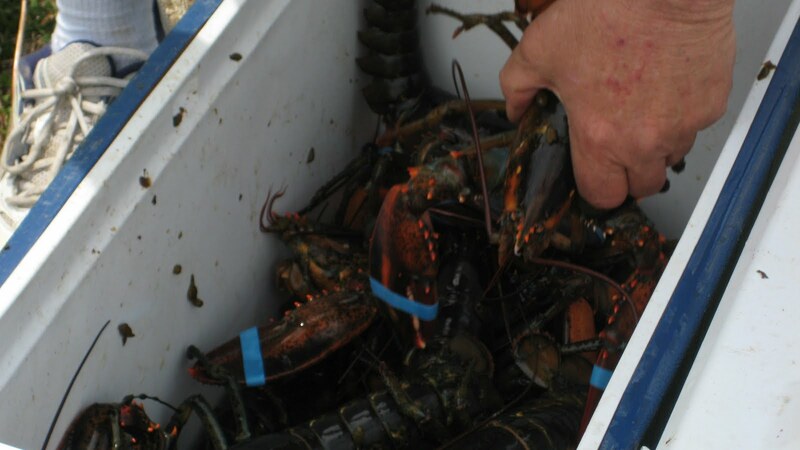 Your lobster should weigh between 1 1/2 and 2 Lbs. Step 3 Cleaning the lobster: Split the lobster down the length of it. For Presentation do not completly cut in half, butterfly it. Scrape out the dark green, This is the stomach & intestine. The yellowish green stuff is the liver, or tomalley some people find this delicious and leave it in. If you happen to find a long reddish orange strip of roe, or eggs these also can be left in. Remove the claws from the point that connects with the body. Split the largest section of the claw by slamming a large knife down on it. Add a bit of salt, I prefer Sea Salt, to the meat part of the lobster body and place on the grill. Place the claws, still in the shells, with the body and grill for about 3 minutes. Turn over and cook for About 4 minutes more, or until the meat is white and firm and the shell is a bright red. Do not over cook. When most people think of cooking on the grill breakfast is the last thing from their mind. I on the other hand thing the grill is perfect for cooking all meals. There are several methods you can use to cook outside. one is a griddle. These can be placed on any source of heat, be it gas, wood or charcoal. Griddles are perfect when you need a lot of flat cooking surface. grilled french toast stuffed with bananas and peanut butter . Combine Peanut Butter and Cream cheese. Stir until blended. Spread evenly on 8 slices of bread. Place banana slices on top of 4 slices of bread. Top with peanut butter cover bread slices to make 4 sandwiches. Whisk together eggs and milk in a shallow bowl. Melt butter on griddle over medium heat. Dip both sides of each “sandwich” in egg mixture, letting it soak in slightly. Cook in hot griddle until golden brown. Turnand cook other side. Cut the top third off the oranges and scoop out all the pulp; reserve the tops for this recipe and reserve the pulp for another use, if desired. Mix together the brown sugar and cinnamon in a small bowl. For each orange, flatten the dough for 2 biscuits and top them with 2 tablespoons of the brown sugar mixture. Roll the biscuits up into a ball and place them into the oranges. Add 2 tablespoons milk to each orange and put the tops back on. Wrap them individually in 3 layers of foil. Put them directly onto the charcol or wood. cook for 7 to 10 minutes, turning halfway through the cooking time. Some other ideas for breakfast on the grill? How about Grilled fruit skewers? These are awsome brushed with a combination of honey and lime juice. Or you could try grilled breakfast quesadillas. My biggest suggestion for cooking breakfast on the grill, have fun and experiment.